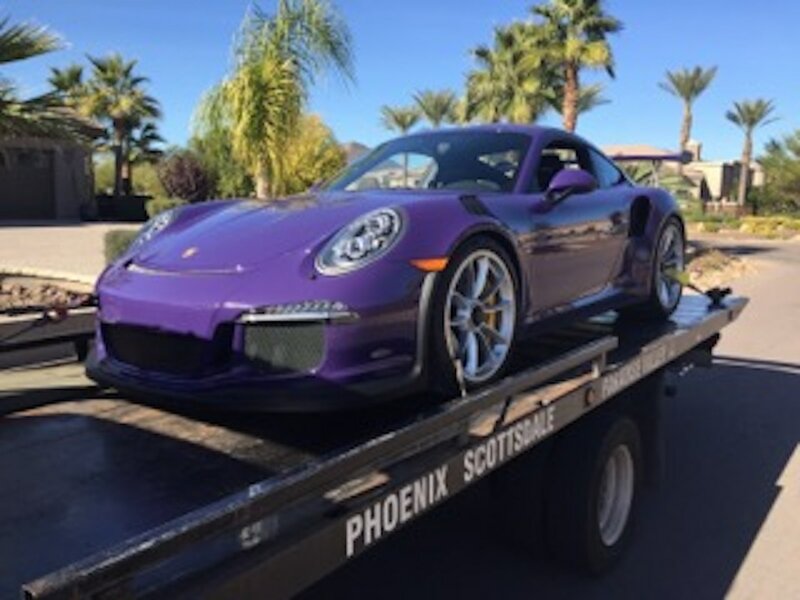 Call us today for your purple car... but it doesn't have to be that color! When you need the fastest, most professional service in town, there really is nobody better to call than us. From our friendly voice over the phone, to our top class methods in loading your vehicle on our flatbed trucks, you'll feel comfortable from start to finish. Your comfort is our priority during your time of need. Our prices are the best around also. With a $65 hook up fee, and $4/mile, you get the best service in the valley, at the best price. If that's not a win-win situation, we don't know what is. Why would you want a flatbed, instead of Tommy the tow truck driver who uses his old-school wheel lift truck? Because you don't want your front bumper left on the 101, or your fenders ripped off and mangled like it's nothing. Your car has already suffered enough damage, there's no point in causing a bigger headache for you to deal with. Our methods are top of the line, and we take every measure to ensure your car is unscathed from start to finish, and delivered to your place of choosing in record time, every time. Sticking to those methods has enabled us to provide the best towing Scottsdale has ever seen. Ever wonder why Scottsdale, Arizona is such a popular city? It's full of great attractions and great people. Known for it's luxurious spa resorts and world class golf courses like TPC Scottsdale, you really can't go wrong in either settling here, or coming out for a nice vacation. It's home to some of Arizona's most beautiful architecture as Old Town is lined with buildings from the 1920's. Frank Lloyd Wright's Taliesin West is a must see for anyone here for a short stay. The feeling you get just walking up to the place in indescribable. If you're a lover of art, it's definitely worth your time to pop on over to the Scottsdale Museum of Contemporary Art and see some of the most unique musical instruments the world has ever known. The museum sits in an old movie theater that was completely renovated. No matter what kind of person you are, you'll find that Scottsdale offers a little bit of everything, making it very inviting to almost anyone. If you're here in summer, just be prepared to deal with the heat, as temperatures can near 120 degrees Fahrenheit during the hottest months. Regardless of your reason for being in Scottsdale, whether you live here, or you're an out-of-town visitor, it's our sincere hope that if you need roadside assistance of any kind, you call on us, your trusted local pros.